One of the great things about good travel credit cards is the travel-related insurance they include for free. Many cards include trip cancellation/interruption coverage, checked baggage coverage, and rental car coverage. You might think that means you don't need to buy a traditional travel insurance plan for your trip. Unfortunately, there's one important type of coverage that credit cards tend to leave out — emergency medical coverage. Beth Godlin, president of Aon Affinity Travel Practice, says that it's a "dangerous assumption" to presume that your credit card offers medical coverage. And it's equally dangerous to assume that your health insurance will cover you abroad. Chances are it won't, but you should check your policy to make sure. "No one wants to get sick or have an accident, especially during a dream vacation, but it happens," says Godlin. "It could be a minor issue that's resolved by a visit to the cruise ship doctor, or it could be more severe and require medical attention or even an emergency evacuation." For these reasons, travelers — particularly those heading abroad or to a remote location — need to understand if their current medical insurance would cover any care or even emergency evacuation required during their trip. If not, they should seriously consider buying the right supplementary coverage. Carol Mueller, vice president of marketing at Berkshire Hathaway Travel Protection, suggests shopping around among travel insurance providers and finding one that offers at least $15,000 in emergency medical coverage for a basic trip. Even if you're healthy, "you never know what will happen when you travel," she says. It's important to keep in mind how stressful and demanding it can be to become injured or ill abroad. Let's say you sprain your ankle, get a nasty ear infection, or have a heart attack. Mueller says that many people are surprised by the fact that the second you walk into the hospital, they ask for your credit card in many places around the world. To protect your finances and keep your stress levels under control, Mueller suggests using a travel insurance provider that will work with medical teams anywhere in the world to make prepayments for your care. You may have the option to pay your medical bills with a credit card and then ask for reimbursement when you get home, but some travel insurance companies will go the extra mile to get your bills paid upfront. "A good travel policy will not only make sure you're getting charged a fair amount, but they'll also ensure you're getting adequate care in the country you're traveling in," says Mueller. While $15,000 may be the minimum you should settle on for emergency medical coverage, you can buy policies with higher limits. Berkshire Hathaway Travel Protection offers plans with up to $50,000 in emergency medical coverage, for example. In terms of what is covered by emergency medical coverage, any medical expenses incurred while you're traveling are fair game. This includes medical care for both injury and sickness. Mueller notes that you should also make sure you have cancellation coverage in your policy as an extra precaution in the case of illness or injury. "Let's say that you leave for your trip within a few months, but you get sick right before you go," she says. "With travel insurance that offers some sort of cancellation coverage, you may be able to cancel your trip and get your money back if you follow your policy's terms and conditions." In addition to medical coverage that pays for surprise bills related to an injury or illness, you should also make sure you have adequate emergency evacuation coverage. This is a separate type of insurance from emergency medical, so it will be listed separately on your travel insurance policy and have a separate limit for coverage. Mueller says that you should look for a comprehensive travel insurance plan that includes emergency evacuation coverage with limits of $150,000-$500,000. That may sound like a lot, but evacuation costs can be astronomical if you need to travel far to get home or to a hospital that can help with your condition. If you're taking a cruise, for example, think of all the expenses it would take to get you from the middle of the ocean to a hospital in the U.S. Your ship might have to get the Coast Guard involved, and you may require transport in several different vessels. Or, imagine you're hiking the Swiss Alps and break your ankle. You may require pickup in a helicopter and transport in a plane. When you think of emergency medical evacuation coverage that way, it's easy to see how you could need $500,000 in coverage — or even more. Both Mueller and Godlin suggest shopping around to find an affordable policy that provides limits you feel comfortable with. 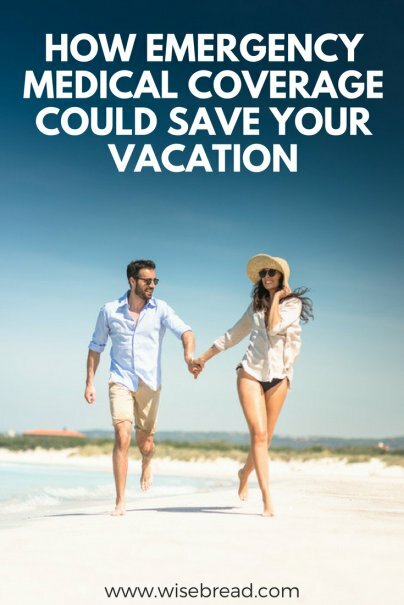 And when you're spending several thousand dollars on a trip, it's smart not to cheap out on coverage that can keep you safe from financial harm. "It's important to consider the total investment made for a trip relative to the nominal cost to protect it with travel protection," says Godlin. "Sometimes a relatively small investment can have a huge payoff for traveler safety and peace of mind." Since many plans have different tiers of coverage, Mueller suggests calling providers you're interested in working with and talking through the "what ifs" with them as you shop. "A lot of times, the insurance company will consult with you to figure out the best plan for your needs at the lowest cost possible," she says. The bottom line: There's nothing wrong with using your credit card's travel insurance coverage to protect your trip, but you need emergency medical coverage to protect your finances in case you're hurt or sick. If you don't get it, your dream vacation could turn into a financial nightmare a lot faster than you think.